Abel Regalado Abel Regalado has lived in East Oakland all of his life and is a senior at ARISE High School, a social justice - oriented charter school. Abel’s passion for tech inclusion and computer science sprouted from the lack of equal resources throughout his community. Abel is the founder of his school's first computer science program, ARISE Hacks, where he introduces his peers to code. Abel understands the life that youth in East Oakland are exposed to, so he is motivated by working with these youth to expose them to the wonders that computer science has to offer. Like many youth in his community, Abel has grown up through adversity, and has been able to overcome family struggles. Because of his resilience, he was selected in the Students Rising Above Class of 2017 scholarship program which will assist him in attending a four-year university to continue his passion in computer science. He has hopes of staying in the Bay Area to attend UC Berkeley or Stanford in the fall of 2017, then bring back his knowledge to his community. Cinque Mubarak Cinque Mubarak grew up in Oakland CA. He attends Berkeley City College and is looking to transfer to a four-year school. During his spare time, he explores human emotion and interaction through street photography. He looks to influence self love through photo journalism and marketing. If he's not taking photos, you can find him listening to Jimi Hendrix, roaming the streets of Oakland on his skateboard. Damu Dailey Delving into modern media platforms through historical documentaries and creative podcasting, Dailey is now seeking to write about global issues and newsworthy cultures that affect us all locally. Through writing and photojournalism, he is presently working to capture the underlying subtext and topical narratives of today. 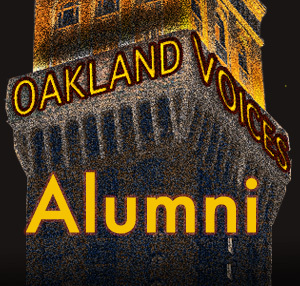 Raised in the Mandela Parkway area of Oakland, Dailey is proud to delve deeper and share with "Oakland Voice's." Katharine Davies Samway Katharine Davies Samway grew up in England, but has lived in the U.S. for over 40 years, 30 of them in Oakland. She is an educator, researcher, and writer. Kat Ferreira An Oakland resident for over 20 years, Kat Ferreira's local Fruitvale area roots skip back a few generations to the early 1900s. Active in the community, she has volunteered with a variety of Oakland-based nonprofit organizations and neighborhood groups, including the Eastlake Music Festival, Friends of the Oakland Fox theater, Wardrobe for Opportunity, and more. Her professional background spans the public, private, and nonprofit sectors, with an emphasis on community advocacy, nonprofit fundraising, social policy research, online marketing and social media. You can follow Kat on?Twitter and Instagram. Marabet Morales Marabet Morales is a twenty-one year old college student. Marabet is an Oakland native but identifies as Guatemalan-American. She is bilingual and attempts to write in Spanish every once in a blue moon. She is currently a student at Berkeley City College and is in the midst of applying to transfer to SF State for Creative Writing. Her goal is to eventually become an editor for a publishing company. She believes that helping cultivate a passion for reading in young children is essential for the future. Marabet’s love for Oakland, writing, and working hard for her community is what drives her everyday. She wants to be a role model for young women of color who want to write or be artists. She writes this article in hope that somewhere a young woman will find her voice as she was able to do. An interesting but weird fact about Marabet is that she is allergic to nutella. Monica Green Monica Scott Green is the Family and School Partnership Lead at Bay Area Parent Leadership p Action Network (PLAN) where she assists school communities to develop systems to engage families as equal partners in their children’s education.? She believes that families, schools and communities share equal responsibility for children’s education.? She appreciates learning about the rich cultural history and diversity families bring to Oakland schools and has studied throughout the Pacific Rim. Monica Green has a doctorate in organizational leadership from University of San Francisco School of Education.? Monica enjoys rowing on Lake Merritt and dancing with her husband of 25 years, Gerald Green. Their son Charles lives in the Denver area.? Sandra Tavel Sandra Tavel lives and works in East Oakland. Emigrating from La Paz, Bolivia and growing up in suburban Denver shaped her desire to put roots down in a place that is diverse, politically progressive and rich in social justice oriented history.? This journey brought her to Oakland, which gets a disturbing and bizarre rap on much of the media that exists today. She’s looking to move the needle to create different narratives that reflect the complexity and nuances that make Oakland what it is. She has been an avid writer and voracious reader her whole life.? When she’s not working, reading or writing, you can find her at yoga class, hiking the Redwood Regional Park System or playing on the beach with her partner and two dogs. เครดิตฟรี100ถอนได้Tony Daquipa Tony Daquipa is a musician who has been studying and playing a variety of percussion instruments since 1986. In the 1990s, he was also a journalist, historian, and community activist. After that, he worked in non-profit public health for 13 years, during which time he also returned to school to study public policy. He is in his third year of working in the public sector. In addition to public service and music, Tony is a proud parent, public school advocate, published poet, photographer, hop farmer, collector of East Oakland rainwater, urban bicyclist, karaoke diva, grumpy old man, storyteller, and preserver of history.